Former Environmental Club member recipients of the $1,000 scholarship were Kayla Rini in 2014 and Evelyne Richardson-Thomas in 2015. STEM (Save the Environment of Moorestown) members met with the Environmental Club to familiarize the students with the scholarship, established in 2014. 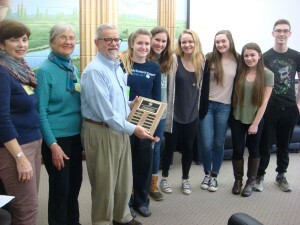 The scholarship is awarded yearly to the Moorestown High School senior who has exhibited outstanding environmental concern and commitment to STEM’s mission to preserve, protect and enhance the natural environment of Moorestown for today’s and future generations. Students were encouraged to keep a list of their environmental activities throughout their high school years to submit at scholarship application time during their senior year. Becoming a STEM member and receiving the Newsletter four times a year informs readers of a variety of opportunities to help out, including working in Natural Area Care (NAC) projects and at STEM Steps Out (in the fall), and submitting articles to the magazine about club doings, and photos to the photo contest in June. Further information is available at www.stemonline.org.